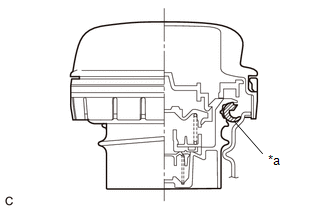 (a) Visually check that the fuel tank cap assembly and gasket are not deformed or damaged. If the result is not as specified, replace the fuel tank cap assembly. (b) Confirm that ID mark S is printed on the fuel tank cap assembly. 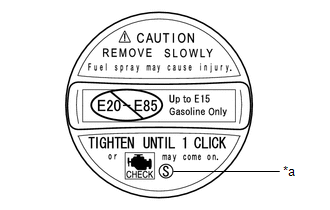 Make sure to use a fuel tank cap assembly that has the same ID mark, or a malfunction may occur in the fuel system.